This course will help math teachers use this problem-solving guide to quickly know exactly what to do for students who struggle with math. 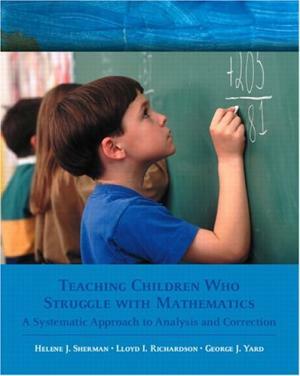 Basic math concepts and skills, such as place values, whole number computation, decimals and problem-solving are re-presented to help teachers reach students. Educators will evaluate their instructional approaches and adapt a systematic approach to analysis and correction strategies for instruction that enhances learning mathematics. Participants will writings and develop lessons or activities for classroom applications that help students remediate and understand and compute mathematics. Educators will learn about the dissimilar learner and techniques to help students who struggle with mathematics use strategies for using place value in a variety of techniques. Teachers will reexamine the addition of whole numbers to present the process using a variety of techniques. Then use the techniques in the subtraction of whole numbers. Educators will learn about applying a variety of techniques for multiplication and division to reach the diverse perspectives and learning styles of students. A variety of instructional approaches for understanding rational numbers with decimals and presenting them to students who have a hard time working with numbers.